2. Goals of the working visit. 4. Evaluation of the working visit. 5. Recommendations for the year 2015. 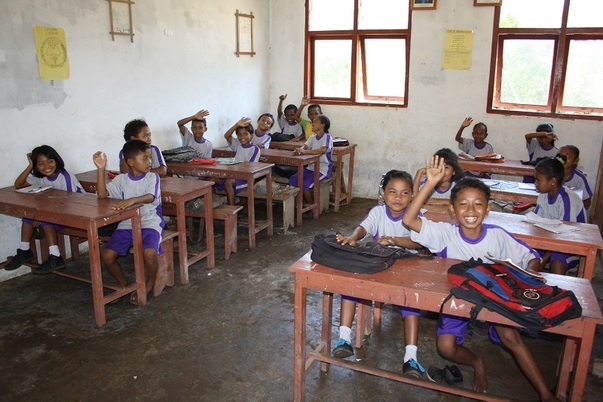 During fall in the year 2011, a handful of Indonesia enthusiast decided to start a non-profit organization called 'Tolong Flores', aiming to aid the local inhabitants – and doing so specifically by supporting a school where possible. December the 16th this organization is established formally at the Dutch Chamber of Commerce, number 54156475. “Establishing or supporting one or multiple schools on the island of Flores Indonesia in particular, where the local inhabitants can hardly or not at all provide themselves with substantial forms of education, this seen in the broader scope of raising the standard of living and economic chances of the local inhabitants, carrying out the work that may be related to, or help attaining this goal. Since 2012, a yearly working visit takes place. On the one hand to keep empowering and encouraging the school as well as the organization, and on the other hand to keep track of the schools development process. - The educational development of the school. - The utility and supply of water related projects, e.g. the water well. - The computer literacy education. - The teaching of English. - Materials used for sports and games. - The furniture of the school, especially filing cabinets. C. The evaluation of current policy. Tuesday morning the 29th of April we arrived at the school. Awaiting our crew, we were thankfully gifted a live chicken upon arrival, symboling the appreciative communal spirit, friendship, and love. During this morning a in-depth conversation is held regarding the days to come, going over the goals and contents of this working visit to make sure the team can get the most of the little time they have in Gorontalo. - The educational growth of the school. The fact that we have brought learning materials to the school helped. For the past two years grades are on the rise. Other positive news is the fact that the team concluded that courses are completed more rapidly, teaching the children more in less time. This is partly due to the schoolbooks – all the information doesn't have to be transferred by the teacher any longer. -The utility and supply of water related projects, e.g. the water well. In January 2014, the construction of the water well has experienced huge progress among others – the old restroom has been renovated completely, a water-pump was installed as well as a connecting plumbing system. A beautiful result thanks to the effort of the school board, local companies, and sponsorship. - The computer literacy. The team has concluded that the now-available computers are used sparsely, the provided beamer is used incidentally. These are things which need to be assessed. - The teaching of English. To this date, no English teacher has been found although this is highly important since a basic understanding of the English language would improve their chances in the pursuit of a career later on. - Game and learning materials for the new curriculum for diverse courses, dolls for the biology lessons, as well as (foot)balls, badminton rackets and alike. - General learning goods such as pens, paper etc. - Furniture; especially steel filing cabinets for storing goods dust and moist free which elongate the lifespan of the schools belongings. - WIFI and related equipment for enhancing the internal and external communication. - Two large tents and complementary mattresses which enables the children to go to official governmental meetings, and attend school-camp in the nearby area. C. During the visit we've evaluated the policy. In order to keep the 'ANBI'-status, non-profit organizations are required to formulate a 5-year policy plan. This is difficult, since the school has a short-term vision in terms of acting. - The school now has reached a point wherein it has a basic amount of school materials provided for. 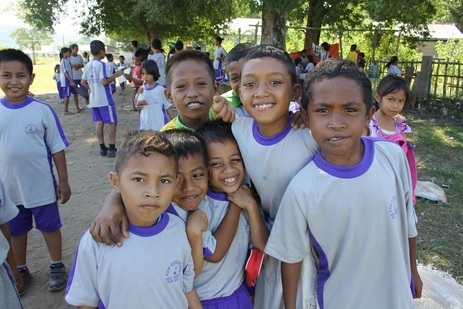 This is one of the most pressing problems around schools in Flores, Indonesia. The intention is not to make the school one of excellence – the goal is to provide decent education where needed. - The poor understanding of the English language still is a threshold. Adequate steps must be taken. - The same goes for the usage of the computer during classes. Again, there is success when it comes to the working visit. The effort, drive, and involvement with which the schoolteam. the parents, and the children work are heartwarming. The goals set out for the working visit have been met accordingly. The educational level has been stimulated to grow even more due to the extra provided materials. The level of hygiene has improved thanks to the now active plumbing system, water-pump, the renovated restroom and the waterwell. There are some concerns regarding the English courses. In the near future, a comparison has to be made with other schools around Flores in order to know our organizations future priorities. 1. In terms of facilities and materials, the school has been altered to an acceptable level. Are we, as an organization ready to take on another school without loosing sight of the first? 2. How can we prevent children in the future form dropping out of school after primary education? According to the school staff, the dropout percentage is a minimum of 30%, which means that 30% of the children attending school do not or can not take the next step of in their education – attaining high school. Is there a possibility for us to provide funding to these dropouts in form of donations? How are we going to organize such ideas? 3. How can we further form the English courses? Attracting students instead of a paid teacher perhaps? 4. How can we integrate the usage of computers during class? 5. Is there a possibility that young people from the age of 13 and above can take sponsored English classes to provide them with better career perspectives? Sandi is looking into this.